Hi there! Today I’m sharing a review for a book that I’ve held off reading far too long. 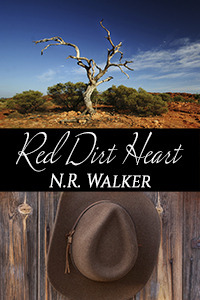 RED DIRT HEART is a contemporary M/M romance series from N. R. Walker, and I’ve owned all four volumes for *shockingly* more than a year, yet never cracked it once. AND I KNOW IT’S GOOD. I’ve seen the reviews. I just never got around to it…until now. I’m embarrassed I’ve held onto this book so long and not read it. Life got in my may it seems. That said, Book 1 of this series is so lovely I jumped straight into the sequel. I’d honestly binge-read them all if my life wasn’t intruding on my reading. So…Charlie Sutton is a 26 y/o cattle farmer operating Sutton Station in the middle of Autralia’s Outback ever since his father died three years prior. He had a real clash with his homophobic father, and planned to never return to his birthright. The brutal landscape is host to red dirt, extreme heat, and flash flooding. Charlie’s a closeted gay man, certain he’ll spend his life alone and celibate. Though his station (think: ranch) is enormous, it’s also hundreds of kilometers from the nearest town. No opportunities to meet a man to pique his interest. Plus, who would choose to live in such isolation? He has some dedicated hands on the station, but they’re staff. His own mother left when he was a small child. Travis Craig is not your typical Texas cowboy. He’s booked a four-week stay at Sutton Station to study the harsh farming environment of Australia, and he’s rarin’ to go. Also, he’s 23 y/o, and gorgeous. Charlie’s mortified at how attractive he finds his new (temporary) employee. He’s so overwrought about it, he starts treating Travis kinda badly–until Travis gets right into his face and lets Charlie know that his interest is not only noted, it’s reciprocated. They begin a completely-on-the-down-low tryst, and it’s so bittersweet. Charlie’s falling hard for Travis, and saving up every single memory knowing that they only have a few weeks to share. Well, unless Travis gets his way, that is. It’s a beautiful romance with an HEA that’s spectacular. Like I said, I jumped right into the second book, and–schedule willing–I’ll finish the whole series in the next couple of weeks. If you’ve been wondering if you should to dive into this series, the answer is heck yeah. It brought me back to my Thorn Birds love affair, only because the setting is so lush it’s almost another character. Plenty of lovin’ going on here, too. I loved how Charlie found such a great connection with Travis, and began to allow himself to live again. Interested? You can find RED DIRT HEART (Book 1) on Goodreads, Amazon ($.99! ), Barnes & Noble and AllRomance. I admire a story with a strong sense of setting. Me too. Especially when it’s a place I’ve never been. I love to feel transported.